An Andean mummy in Ecuador may be the missing link to understanding the expansion of rheumatoid polyarthritis from the Americas to Europe. Its naturally mummified remains are set to change both local and international history. Rheumatoid polyarthritis is an autoimmune disease that most often affects hand and feet joints and may cause their deformity, destruction, and loss of function. This painful disease produces chronic inflammation of five or more joints at once. El Comercio reports that during his first examination of the naturally mummified body, French scientist Philippe Charlier noted signs of rheumatoid polyarthritis in its deformed fingers and toes. The origins of this illness could be either genetic or infectious. “This mummy is extremely important for the history of illness” Charlier said . Studies have shown that rheumatoid polyarthritis was prevalent in the American population at the time of the Spanish conquest, however it was extremely rare in Europe and Asia until later. It is believed that rheumatoid polyarthritis was brought back to Europe following the return of Spanish conquistadors. Who is the Mummy of Guano? The mummy of Guano was found following an earthquake in the small town of Guano in Ecuador on August 5, 1949. It was discovered in a large jar amongst rubble after one of the walls fell in the old church of Asunción de Guano. 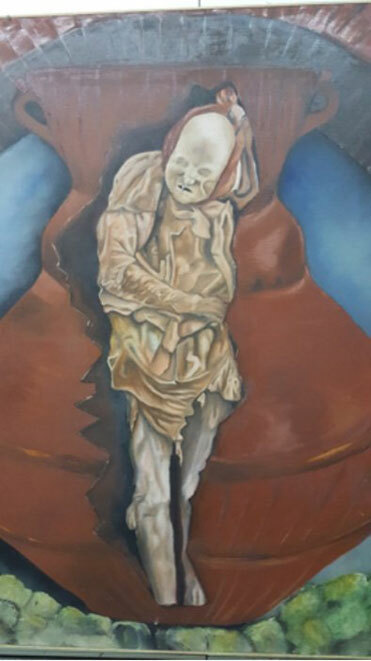 Mural painting of the mummy in the jar. Image courtesy of Chris Aguilar. It is generally accepted that the body is of Fray Lázaro de Santofimia, a religious man sent from Spain to spread Catholicism around rural Ecuador. He gave indigenous people living around the town of Guano food and other aid and from 1565 to 1572 he was a guardian of the church the mummy was found in. This had led to the belief that he may have been buried there so “his soul could roam around and always be there looking over” the local people. The jar the mummy was placed in has disappeared and no one can say for certain why the man’s body was laid to rest there and covered in the white powder called cal. But when the mummy was discovered, it was wearing a scarf around its chin. Some believed it was just a tradition from the time and others said it was to keep its mouth closed. But many researchers have asserted the man died when he had a painful toothache. Charlier has confirmed that there is a six-mm (0.24-inch) fistula on the left side of the chin which was created by pus flowing from a large abscess in the jaw, and he believes the infection caused the man’s death when it spread from his mouth to his skin, blood, and brain. Although the stories of the lonely Franciscan with a rat as his only friend are unlikely to be true, the little mummified rodent found by the man’s body will also be examined to see if it bore any plagues. The mouse found with the mummy of Guano. Image courtesy of Chris Aguilar. Charlier was also pleasantly surprised by the mummy’s well-preserved state, he told El Ciudadano , “It doesn’t fall apart or disintegrate. There is no humidity or mold, its perfect.” So far, CT scans show that the mummy’s brain, heart, kidneys, prostate and part of its lungs have been preserved. The mummy’s identity will be better understood following DNA and Carbon 14 testing, which will have their results in the next six months. Samples of the mummy’s hair will be analyzed and fiberoptic and toxicological testing are set to take place. 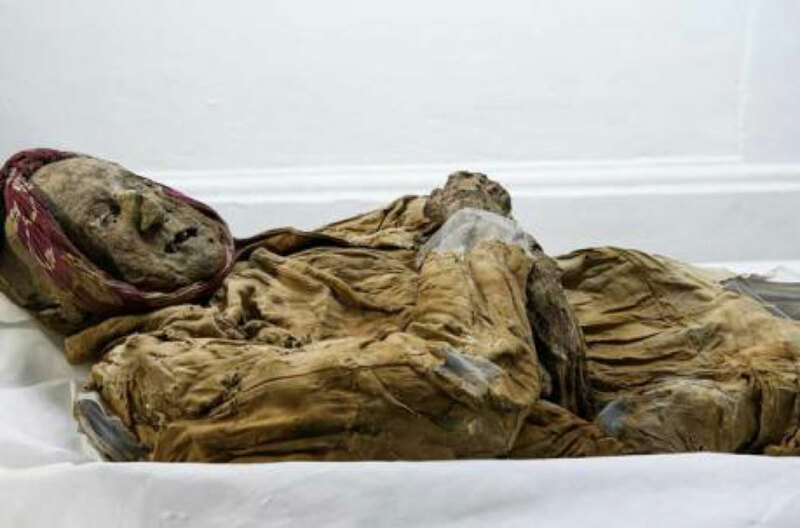 This will provide researchers with a better understanding of not only the mummified man, but also what life was like in the Andean province of Chimborazo during the 16th century. The mystery white powder referred to as "cal" is lime in English, so no mystery there. It is still used today in cases of mass deaths, to slow down decomposition and allow for burials before deseases start to spread. That "jar" is no mystery either, it was standard practice amongst natives to burry their dead in these mortuary urns. What is a little strange is for a Spaniard to be buried in an urn, maybe it was done in a hurry becase people feared contagion or maybe he was just a lowly native janitor and not a friar, in which case it would have been an honor to be buried in a church.